He is just starting back to work and he is currently walking and trotting. He feels sound. He does have an old knee injury that would maybe limit his jumping ability. He has a very laid back personality and is easy to be around. He is currently being ridden w, t, c. We are working on building his top line by letting him reach down. He had a few years off and lost most of the muscling on his back. He is such a gem! When I started working with him he was a little indifferent to me, but now he is so happy to be getting attention and is enjoying being back in work. He looks forward to seeing me everyday and is always waiting by the gate to be next in line. He will follow me around, even after his work is done, while I am trying to get the next horse to ride. 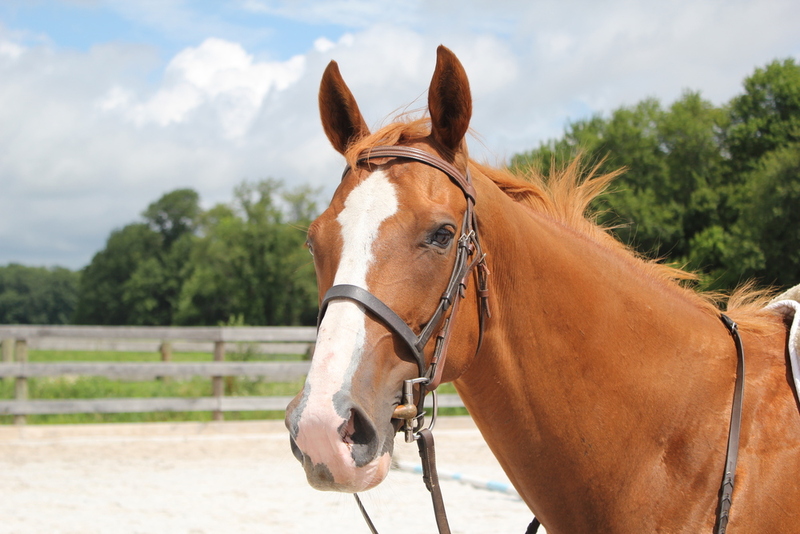 If you are looking for a horse to be your best friend and also have fun riding....then he is your man! We have been bringing him to a stall during the day and he really enjoys a good flat out nap! I have taken him on the trail, he had a few anxious moments but settled down with my encouragement. He both led and followed, but I would like to take him out a few more times before I say he is trail ready. He walked up the road twice now and was comfortable with cars. He walked up the road twice now and was comfortable with cars. Captain is such a gentleman to handle, we thought we would share a video showing just how quiet and patient he is on the cross ties! There is also some riding footage at the end! 15.1 hand chestnut mare rescued from New Holland. She is currently going walk, trot and canter. She easily gets both leads and goes in a hunter frame. She is level headed, a cute mover and seems willing to please. We will try and trail ride her in the next couple of weeks and update on that when I do. Kenoa had some R&R time after being rescued from New Holland, she is now back to work and is going well. We are not aware of any past injuries and do not believe there are any limits to her abilities. She goes w,t,c and is also jumping small jumps. 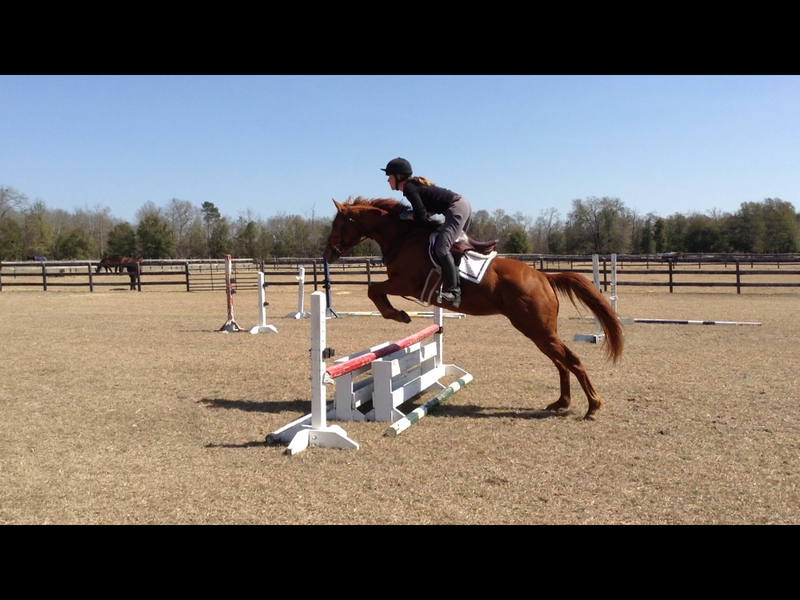 This winter she even schooled some XC jumps! She was good to the water, ditch and bank! She is a good mover and has a forward thinking brain. She does need an experienced rider to bring her to her full potential. She has no limitations. This mare is very sweet; she is a good mover with a willing attitude. She is currently goes walk, trot and canter. She has no limitations that we know of and would be suitable for any discipline. She is good on trails either leading or following. She may even be a hunt horse candidate. She is just starting back to work so she is just tack walking right now. She is a great girl in the barn; she stands on cross ties and stood like a champ to have her mane pulled! An all around nice girl to be with. 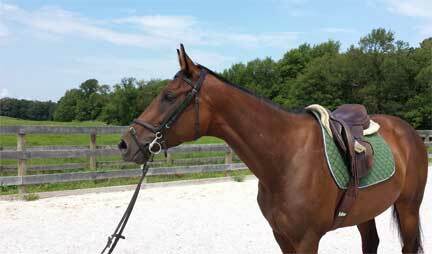 Little Spanish town is a sweet bay gelding who is currently going walk, trot and canter. 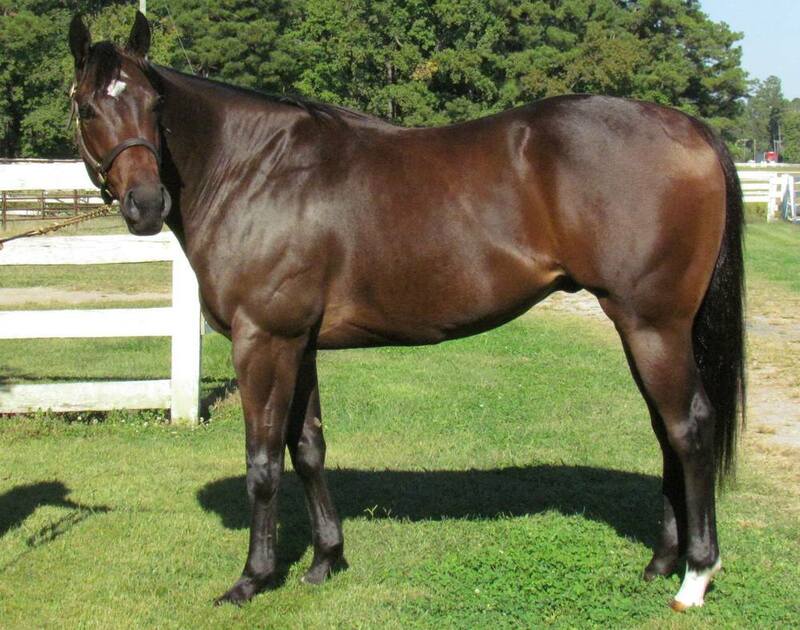 He is a graceful mover with no limitations looking for an experienced rider to bring out his full potential! We love this boy. He is currently going walk, trot, and cantering on the bit. A truly beautiful mover! Enchanted went on his first outing in July to the Mistover Farm Dressage show. He was the perfect gentleman all day. No lunging needed and it was his first time off the property AND his very first show all at once! He is an incredible guy who is also great on the trails. He leads or follows happily. He is best suited to a flat only home or maybe really light jumping. We have 2 quick videos for you: one below showing what a gentleman he is on the cross ties and the video to the right showing a few snips of his very first show! Enchanted went on his first Hunter Pace 9/21/2013 and was a super star! 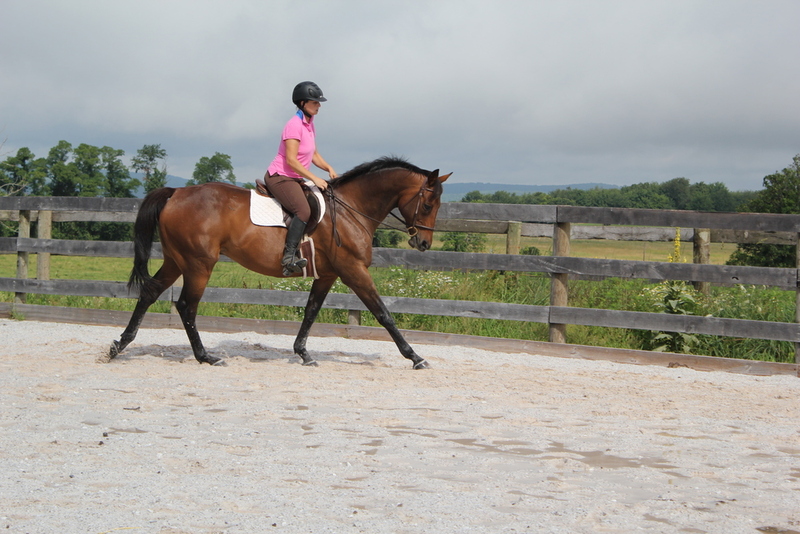 He is a beautiful mover that has been training for his second career for about a year now. He goes on the bit nicely. This summer he is being ridden by our intern Stephanie Izzi. Stephanie is 18 yrs old and has been riding for about five years now. She has done a super job with KGB this summer. 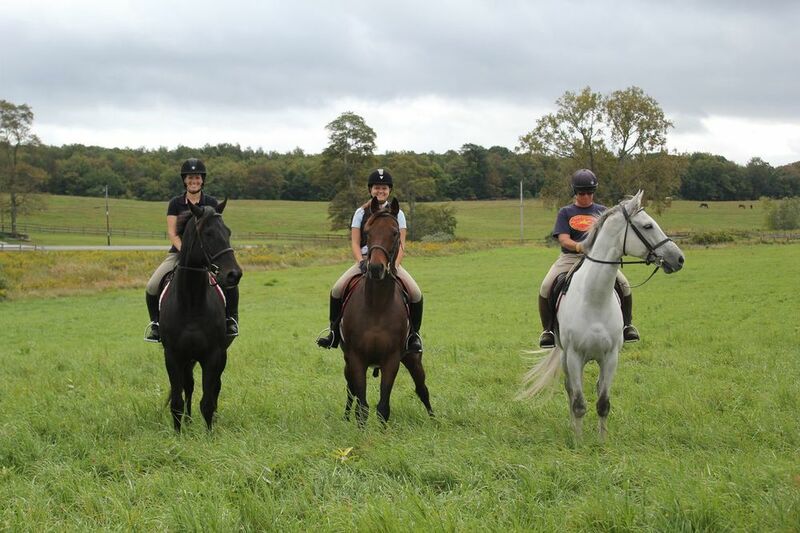 Last year he competed at the all TB Show at Fairhill and was 5th in the under saddle class out of about 35 horses. That was the very first time he had been ridden in a ring with more than two horses. He does trail ride as well but can sometimes be a little antsy on trails. He has an old injury that limits him to flat work but he is sound. She is an absolute gentle giant, such a pleasure to work with! Julie is very willing. She is being legged up at the moment and is walking and trotting and is a lovely mover! Look back for updates as her training continues! 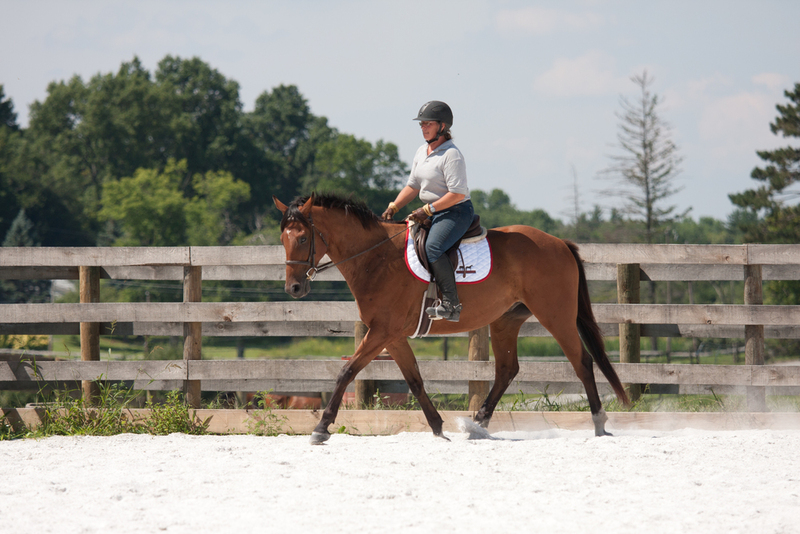 Julie does have an old injury which will limit her to flat work and trails. The following horses have been adopted. Congratulations to our new adopters! Dam was winner of nearly $2.5 million. No vices, sound and barefoot! She is a real gem. She has an old bow to her right front leg that is healed and should be ok for any discipline. She is currently walking and trotting. This girl gives 100% all of the time. She is a real pleaser and a great mover too! She is very easy both on the ground and riding. She would be great for a small adult or a child as she is a petite lady. She went out on her first trail ride and was great! She both led and followed and bravely followed her friend thru water! She is also now learning to go on the bit! She is a really nice girl. She is currently walking and trotting. She has a lovely attitude and has been nothing but great to work with. When she sees you come into the field she starts walking towards you and is always happy to see you! She seems to enjoy the attention. She has no limitations that we are aware of so would be suitable for any discipline. This fantastic gelding has many stories to tell - saved from New Holland's kill pen, he was later found on Craigslist in desperate need of a home and some weight. Today he has transformed into the gorgeous Thoroughbred he was always destined to be. DC can do a bit of everything from dressage to jumpers and has even trail rode on the beach - he would make a fantastic lower level all- around type of horse and is easy to handle in all respects, he even self loads onto the trailer! He showed at the TB Celebration show in June and won a 2nd and a 4th in Intro Dressage, schooled around a 2' 6" hunter course complete with flying changes and was the recipient of an award for Most Starts having ran in 53 races. He is just starting to be brought back to work. He has an old bowed tendon on his right front that is healed and he should be suitable for any discipline. He is a very nice horse, both pleasant to be around and smart. We will know more as his training progresses! 14.3 hand bay mare born 2010. Kat was a twin. Kat was awarded sometime off after being started in her riding career in Aiken, SC this winter. Since she is only 3 and a twin we decided to give her a bit of time off after our initial backing. We are starting her back to work now (Aug 2013). Her walk and trot are great, we are working on her canter, she does get both leads, but she is young and still learning. Please take a moment to watch our video of our friend Ainsley, who is 12 riding Kat. 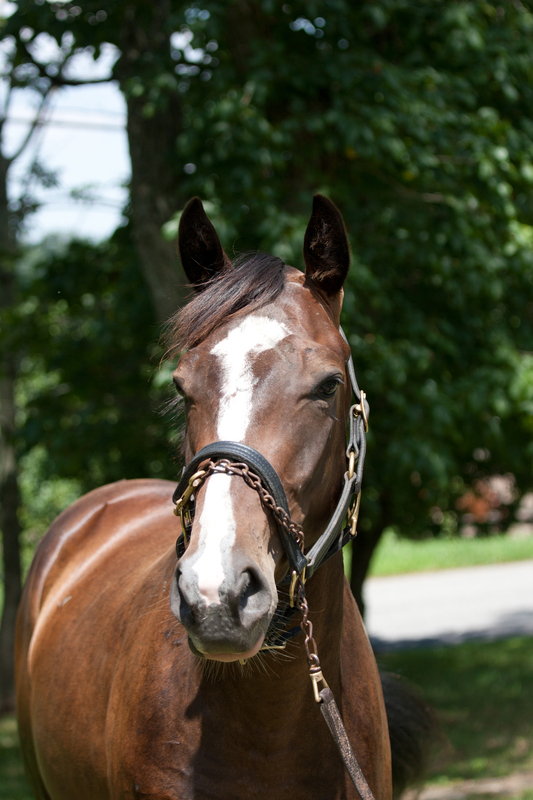 Ainsley will be showing Kat for us at the Fair Hill Thoroughbred Horse Show Saturday, September 7th! AJ was a pony on the race track. He stands about 16.2 hands and is a lovely, big boned boy. He is super sweet and very handsome man. AJ is a beautiful mover and appears to float around the ring. We are still working on his left lead canter, but his right lead canter is “awesome” and with time the left lead will be consistent also. AJ is a love in the barn and would stand on cross ties all day. 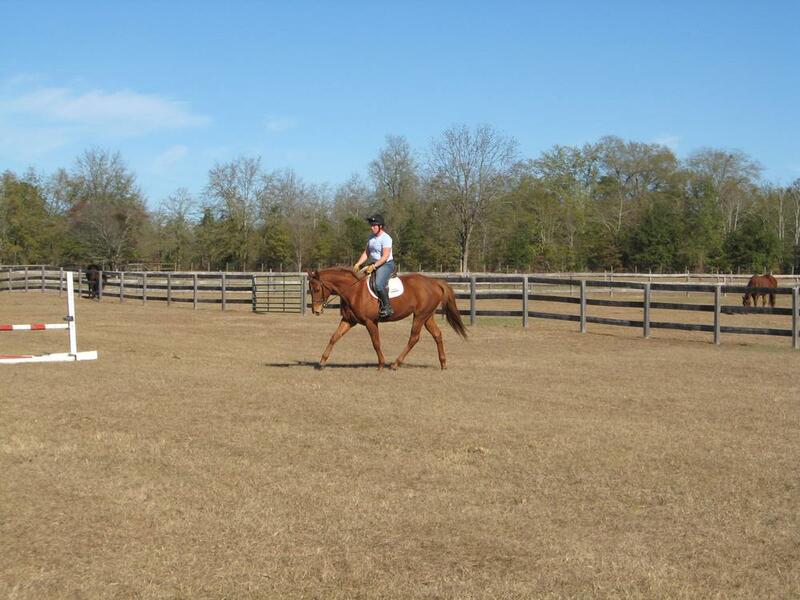 He is quiet in the ring and great out on trails, though he prefers to follow another horse. He aims to please and would love to be fussed over everyday. AJ went on his first hack all by himself, he was truly "awesome"! He encountered many obstacles such as deer, small water crossing, and many speeding cars. He handled each like a perfect gentleman! AJ went on his first Hunter Pace 9/21/2013 and performed like a champ! 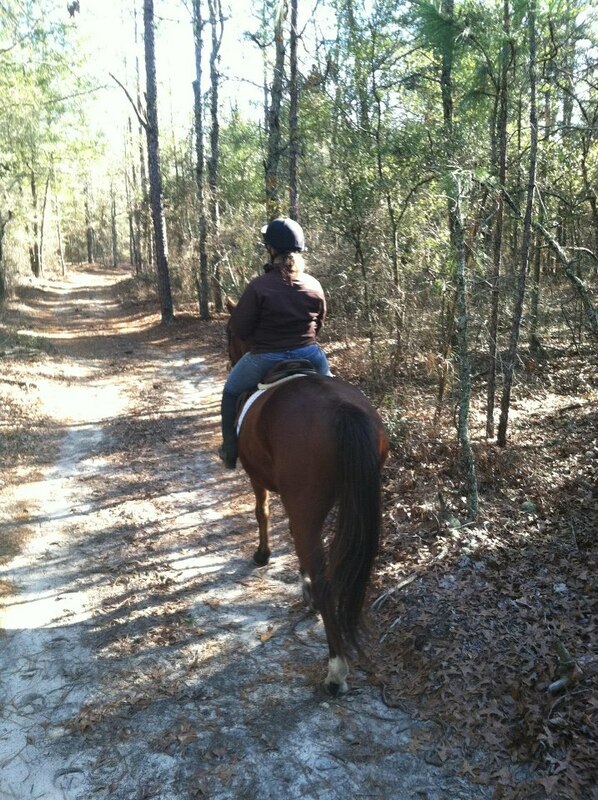 AJ would be best suited for flat work and trail riding.